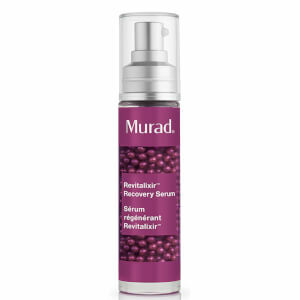 Intensive Wrinkle Reducer™ is formulated with Murad's exclusive anti-aging GlycoNutrient Complex that delivers dramatic results in just minutes. But Intensive Wrinkle Reducer is not just a quick fix; the results will keep improving over time and your skin will not only be more beautiful, but healthier. Intensive Wrinkle Reducer significantly increases skin firmness and hydration levels while providing intense epidermal resurfacing without irritation to gently smooth away fine lines and wrinkles. Within the first 10 minutes ofproduct use, your skin will become firmer by 40%. 33% reduction in appearance offine lines and wrinkles in four weeks with a 55% reduction in just 12 weeks. 44% increase in hydration infour weeks. GlycoNutrient Complex encourages cell turnover, strengthens skin's barrier function and increases firmness and skin density. Glucosamine encourages the production of Hyaluronic Acid to attract moisture and retain skin's natural hydration levels. Lipo-Amino Acid containing Cinnamon Extract improves skin imperfections revealing clearer, more radiant skin. Love it and wouldn't be without it. Use in combo with Murad Perfecting Serum and Perfecting Day Cream SPF30. People actually think I am 10 years younger than I am.....the longer you use it, the better it gets. This stuff really made a difference for me making my pores look smaller and my skin more refined. The eye serum is even better! Being a skincare junkie I have used it all. I read the reviews on this one and had to test it out myself! Literally, after just one night my skin appeared brighter and my make-up went on smoothly the next morning. After 2 weeks I noticed my pores were less sightly, the fine lines around my mouth were not noticeable anymore. I would buy 5 of these if I had the money just to keep it on shelf! A must have for everyone! It really works, I am on the second botle and I love it, even though it's expensive, but it's worth it!!! I started using Murad Intensive Wrinkle reducer 4 wks ago, I can't beleive the difference it has made. The fine lines under my eyes are gone. My skin is clearer and firmer. I know it's pricy, but so is plastic surgery. If you leave your face wet, you can use less. After this, I use the vitamin C nighttime moisturizer and in the day, one of the spf 15 moisturizers. My skin is radiant with incredible elasticity. I wash my face with the hormone aging cleanser. No more dryness, small brown spots, just glowing even toned skin. I highly recommend Murad. It will save you trips to the skin doctor. This is now my 2nd Order of this fabulous product! The lines on my forehead and around my eyes are gone! My coworkers can't believe the difference in just 5 weeks! I love this stuff! PS Can they come out with this for the body?! ?